Our latest battles in the Irish Campaign were fought between the Scots and a Royalist/Irish coalition. Briefly, the Covenant forces of Leven and Monro are attempting to link up near Dundalk. Both armies met opposition in the shape of a combined force of Irish rebels and Royalists blocking their path in a sort of ‘your enemy is my enemy’ way. Monro’s task was to force a passage past the enemy blocking the road to Dundalk at Castle Blaney. This was a frontal assault against fixed positions along a very narrow front which proved a proper slugging match over many turns. 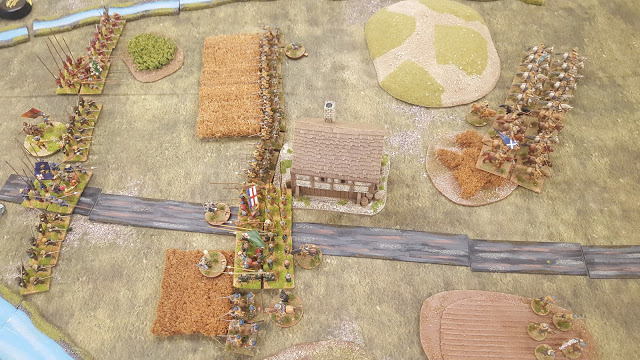 The appearance of some Irish, unexpectedly, in the Scots rear forced them to react and probably saved the defenders from defeat. Fortunately, Leven – on the other table – was having more success and the day ended at last with a strategic victory for the Scots as the Irish dissipated and the Royalists were obliged to retire towards Drogheda. The Club is running an ECW campaign based on the Pike and Shotte rules. It is based in Ireland with multiple fractions vying for control of the counties. There are the Irish Confederates under the commands of MaColla, O’Neil, and Preston together the Irish Connaught under Tuchet. The Scots Covenantars under Lord Levan have landed in the North of Ireland and linked up the with the Covenantars of Londonderry under Robert Munro. The Royalist of Cornwall under Hopton have landed on the west coast of Ireland whilst a seperate force of Royalists under Lord Ormand occupy the land around Dublin. Montrose has landed north of Dublin. Parliamentarian forces under Inchiquin control Cork and the surrounding counties. A second Parliamentarian force is at sea, and no one knows where it will land. There is also a Papal Legate with troops, supplies and money in Ireland and King is in England but contactable. Each player has received an overall briefing and we are in the initial stages of planning our first moves. This is a report on a very early ECW Campaign battle by Alan, originally created as a page and now moved to a post. Butcher Montrose and his devil spawn cavalry attacked the peaceful province of Newry. Burning and pillaging there way through the land, they were met by Colonel Frasier and his brave Musketeers. These brave gentlemen safely escorted the ladies of the provence to the safety of Newry before these fiends gathered there courage to attack. During the fight of the bridge these spawn of the devil cruelly murdered the Parson Williams as he bravely aided the sick and injured of the musketeers, leaving his body in a most distressing state, before they retired in the face of the musketeers fury. Despite the loses of the local population to these devils the people of Newry stand tall and loyal to the true faith in the assurance that the Lord will wreak his vengeance on the unbelievers. Welcome to the new website of the Wessex Wargamers Winchester. We are in the process of moving from our previous hosting service and the web site is under construction. Please return to see our progress. Please see our about page for details of the Club and where to find us.